Other key features of the system are the available methods for collection tube cleaning, gas precleaning, and conditioning. 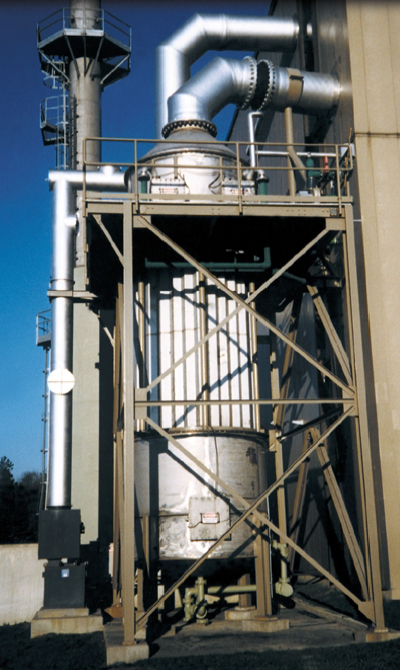 Unlike other precipitators that utilize sprays, overflow weirs or packed marble beds, the HEI WESP incorporates the Ultimix˙ Conditioning System for gas saturation and collection tube cleaning, and the patented RotaBed˙ Pre-Scrubber for acid removal and particulate loading reduction. PLC-based voltage and spark controls (to maintain maximum electric field stability), nonfouling insulator locations, and new improved materials of construction that provide more resistance to corrosive gases complete the advanced yet economical system.